If you heard something that sounded like a squeal of delight yesterday, it probably came from me. Even if it what you heard wasn't me, I can guarantee you I made a whole slew of "happy noises" upon hearing that a second Sega 3D Fukkoku Archives is in the works (and will hit Japanese store shelves on Dec. 23). Granted, I've yet to even stick my copy of the first Sega 3D Fukkoku Archives compilation, which was released in the Land of the Rising Sun late last year, into my import 3DS LL system, but that doesn't mean I can't be stoked about its sequel. Actually, I'd be frothing-at-the-mouth excited about Sega 3D Fukkoku Archives 2 even if I didn't own the original Fukkoku Archives thanks to its meaty lineup of games: Altered Beast, Fantasy Zone II DX, Galaxy Force II, Power Drift, Puyo Puyo 2, Sonic the Hedgehog and Thunder Blade. As of now, the "3D Classics" versions of Power Drift and Puyo Puyo 2 included here will be exclusive to this offering--although I have to imagine they'll receive a broader eShop release at some point down the road. Also exclusive to Sega 3D Fukkoku Archives 2: three-dimensional updates of two old Master System (or Sega Mark III, if that's how you roll) titles, Fantasy Zone II and Maze Walker. Initially I was a bit disappointed to learn that this second collection won't include the just-out 3D Gunstar Heroes, but then it hit me that its MIA status probably means a Sega 3D Fukkoku Archives 3 is more likely than not. 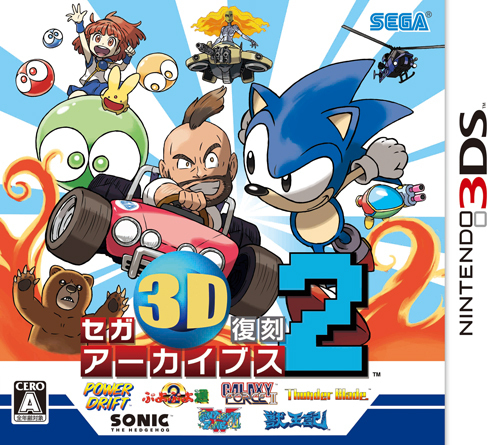 If you'd like to check out a few screenshots of the Sega 3D Fukkoku Archives 2 versions of Power Drift and Puyo Puyo 2, by the way, head on over to japanese3ds.com.